The launch of Far Cry 5 and ensuing discussions about the validity of its storytelling in a post-Trump America have reignited a familiar discussion surrounding its critical reception. Far Cry 5 grapples with weighty storytelling elements (as have many games in the Far Cry series) but it doesn’t quite know what to do with them. It’s clear that a sense of holistic criticism—that is to say, a criticism founded in the game viewed as a complete text, not a collection of systems with a story on top—is necessary to properly judge the game. The hard-and-fast differentiation between the appeal of a game’s narrative and mechanical experiences in reviews is one that game audiences have been taught to expect from a press that traditionally draws a lineage from a merging of an enthusiast press and a tech press. Game criticism often comes from the angle of reviewing a product, and not so much about what the combined effects of a game’s experience say about the game or its intended message. In Far Cry’s case, this isn’t a new discussion—conversations swirled around 2014’s Far Cry 4 for its depiction of a militant insurgency fighting to overthrow a tyrant king, and before that, in 2012’s Far Cry 3, set on a vacation island populated by a warlord’s band of pirates and the populous but unfamiliar-to-the-protagonist Rakyat indigenous tribes. 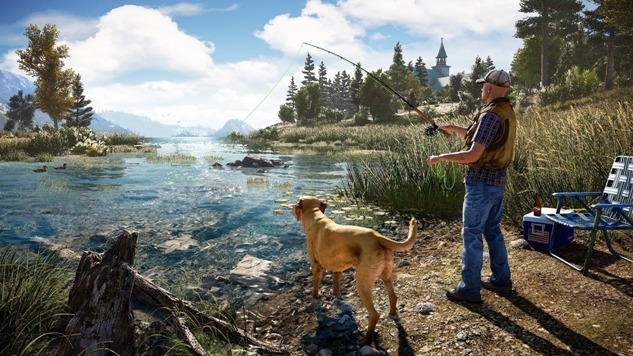 Far Cry 5 continues in this lineage, but shifts the game’s setting from an exoticized non-American locale to a more pointedly “down-home” Montanan landscape. Far Cry’s third and fourth installments were, broadly, received well. Far Cry 3 holds a Metacritic score of 88/100 and Far Cry 4 holds a Metacritic score of 80/100 in both of their respective critic rankings (the user rankings are lower, but not by much). Games like Far Cry—generally AAA games, generally franchise games—maintain popular appeal even when most, if not all critics are of the opinion that the game’s storytelling pales in comparison to its mechanical breadth. There is a discrepancy in their appeal, when focus on one aspect of a game allows more faltering elements to fade into the background, and effectively become forgotten by the majority of the game-playing public. An easy explanation for this discrepancy is the oft-repeated idea that games are first and foremost a collection of systems, of which story is layered on top of, instead of woven into, the fabric of the game itself. It’s a tempting idea, especially for players and designers that approach games from a background of computer sciences. Without diving into the fray of “what is a game,” it’s not as if this isn’t at least partially right—games always include some sort of systemization of action, lest they be completely non-interactive artistic experiences. As such, it’s not that unusual to judge a game chiefly on its mechanical interactions. The problem lies in how easily this viewpoint can be used to allow games’ mechanical and narrative messages to conflict without further inspection. A local farmer taking up arms to deal with a gang of semi-Christian wannabe Nazis is a different story than a police officer brought in to deal with a drug-dealing cult, but the mechanical interaction is the same, or at least extremely similar. Without looking at the game as a cohesive whole, it’s easy to say that while the story might be bad, the mechanics are solid, and thus the game is “good.” But it’s a limited viewpoint, and one that fails to capture the entire picture of what a game is conveying. Reviews and criticism are always going to be subjective. That’s not going to change any time soon. But when we approach complicated texts like Far Cry 5, or other games that intend to “say something” through their narrative, it is important and—to a degree—respectful to the game to judge it by those standards. If Far Cry 5 wants to say something, and it fails to say it in a meaningful or interesting way, maybe we can accept that its narrative isn’t just sitting on top of its mechanics, but that the game itself is worse for it, and deserves to be criticized as such.